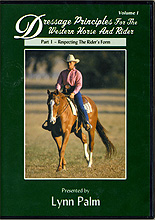 Why is the rider's form so essential to build a rider's skills? Because of relaxation and balance. A rider's position is not a molded form, set rigidly on a horse for the purpose of looking pretty. The rider must position his body in order to follow at all times, and without interference, the horse's every movement and reaction. Through the proper form, the rider can achieve a state of balance that will allow him to feel relaxed and in command of his body, and not interfere with the horse's balance and his responses to the rider. As you practice seriously to condition your body, and utilize exercises to become more supple and flexible, your form becomes centered, balanced, and relaxed. Most importantly, you can coordinate your body parts and mind independently. This is the first step in building articulate communication and willing responses from your horse. DRESSAGE means training of the horse and of the rider to unite as one. It does not matter what type of saddle you use, or what breed of horse you train. If your challenge is to ride for exercise and fitness, ride for pleasure, for the discipline of the sport, or as a serious competitor, RESPECTING THE RIDER'S FORM is the same in any discipline. This Part 1 DVD shows you a series of exercises for every part of your body. These exercises result in your understanding of "Form to Function", making you an effective rider which leads to bringing out the best in your horse.